Ava Galt, Bay Area Museum Guild co-president, from left, and Nina McGlashan welcome new Guild member Kathy Riggle. BAY AREA MUSEUM Guild officials were all in a partying mood as their annual holiday party got underway at the museum in Clear Lake Park where Co-Presidents Carole Murphy and Ava Galt welcomed Robert and Nina McGlashan, Frank Perez and Priscilla Ennis, Peter and Pam Culpepper Cronk, Anita Fogtman and Jerry and Peggy Clause to come right in and join the fun. First Vice President Jan Larson, who came with her husband, Gib, quickly invited them to sample the array of refreshments, along with new arrivals Pat Biddle and her husband, Ron Kahl, Emmeline Dodd and Gene Hollier, David and Cindy Kuenneke, Sharon Ferguson and new members Todd and Kathy Riggle, Neldon and Lois Costin and Donnie Johnson. 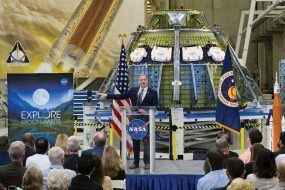 Others joining the celebration included Tony Galt, Gail and Don Devens, Sandi Allbritton, Louise Russell and Keith and Sally Jordan. 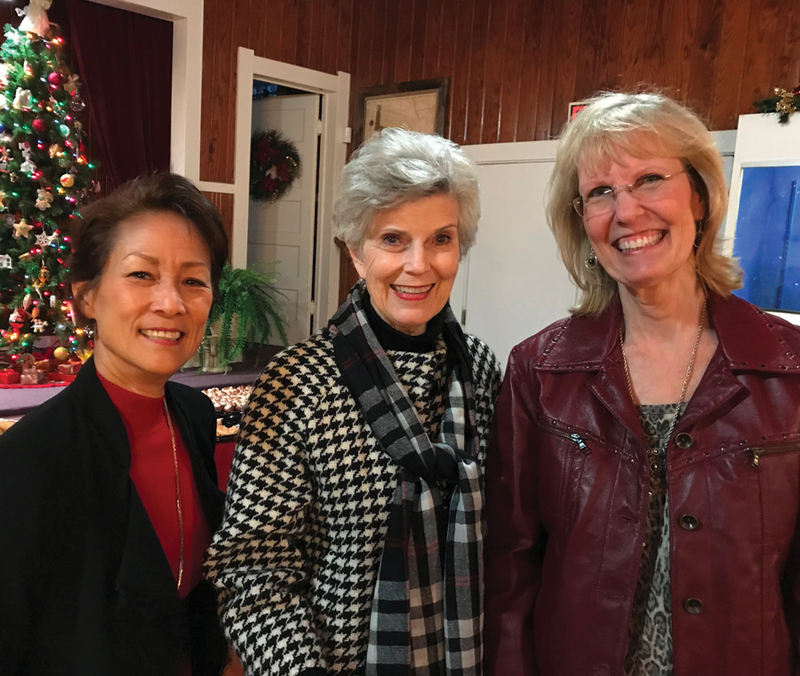 Clear Lake Panhellenic President Michelle Richardson, right, joins hostess Barbara Dickey and Co-Chairmen Judie Ferguson and Sue Ellen Jennings, from left, as they prepare to welcome the arriving crowd to their annual Christmas Party. 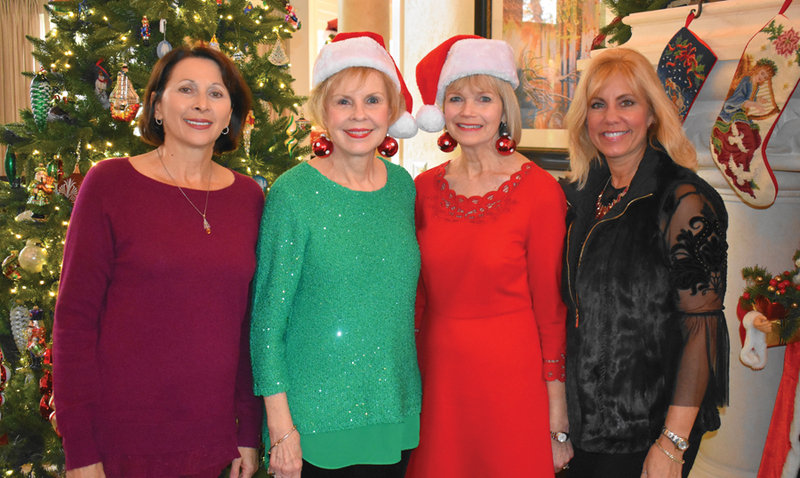 EARLIER THAT DAY, Clear Lake Area Panhellenic members gathered for their annual Christmas Party at Barbara Dickey’s Bay Oaks home in Clear Lake with Co-Hostesses Sue Ellen Jennings and Judie Ferguson assisting and the Clear Lake Soundwaves choir providing entertainment. Besides the beautiful music, some 60 members enjoyed a wonderful buffet lunch provided by board members Michelle Richardson, D’Lisa Johnston, Katheryn Vernau, Greta Mee, Darla McKitrick, Lisa O’Brien and Jill Reason. Another highlight of the day was raffling off five items to raise funds for their scholarship to be presented in the spring. Among those enjoying it all you might have spotted Suzie Rogers, Priscilla Ennis, Kathy Wiley, Jo Cat Bruce, Karen McCorkle, Ondie Lyon, Judy Raiford, Kay Lee Benoit and Jo Nell Hunter, to name a few. Vicki Buxton, right, chairman of the Houston Symphony League Bay Area Holiday Party, goes over final details for the event with hostess Carole Murphy. 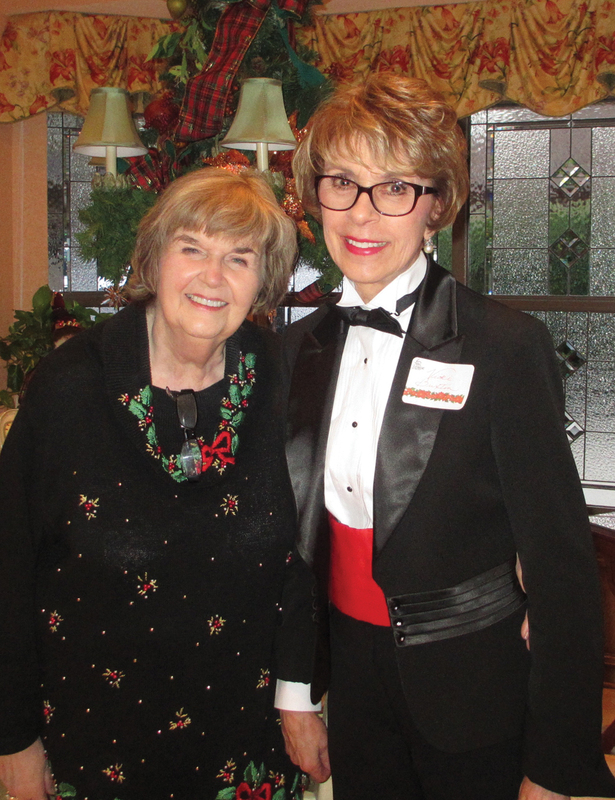 THE INVITATION went out and nearly a hundred Houston Symphony League Bay Area members and their guests arrived at Carole Murphy’s Brook Forest home in Clear Lake, ready to celebrate the season and enjoy each other’s company. With Co-Chairman Vicki Buxton assisting, they quickly welcomed Stephen and Mariglen Glenn, Nina and Bob McGlashan, Jim and Aggie Moore, Glenda and Gene Toole, Anita and Bill Knoles, Kathleen Kearns, Deanna Lamorux, Dr. Horacio Guzman and his wife, Julia, Don and Judy Young, Eva Koll, Myra Barber, Sally Watt, Gillian Ford and Lew and Joan Wade. They had hardly had time to say hello when in walked former Nassau Bay Mayor Don Matter, who now serves on city council, and his wife, Sherri; Janet and Jim Greenwood, Alice Steele, Vicki Buxton and Jim Hall, Pam and Matthew Vining, Betty Geehan, Louise and John Russell, Dana Puddy, Bobbie and Mike Munze, Jane Lackow, Jerry and Mary Ann Brown, Martha Mc Williams, Jean Raffeto, Gayle Nelson and Bobbie and Mike Munze and many more, ready to enjoy a delightful evening.a delightful evening. 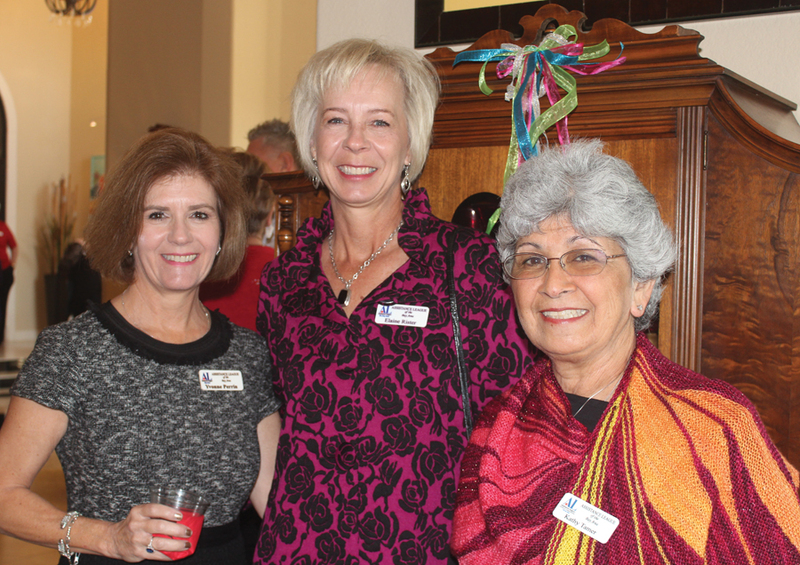 Kathy Tamer, right, stops to talk with Yvonne Perrin, left, and Elaine Rister as she mingles with the crowd at the Assistance League Holiday Open House. ASSISTANCE LEAGUE of the Bay Area members held their annual Holiday Open House Dec. 12 at the home of Cecilia Dismukes in Kemah’s Waterford Oaks. Planned to perfection by Social Chairman Susan McCoy and Vice Chairman Arlis Miles, not a detail was missed. The venue was beautifully decorated, the sweet and savory snacks a delight to everyone’s palette, and a festive environment allowed for great conversation and visiting with both long-time and new friends. 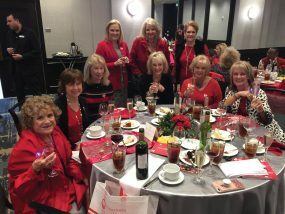 In addition to lots of members taking a break from helping the area’s needy, many chapter supporters and partners could be found in the crowd. Many volunteered to prepare favorite recipes from both of the league’s award-winning cookbooks, Settings on the Dock of the Bay and Setting Sunrise to Sunset. 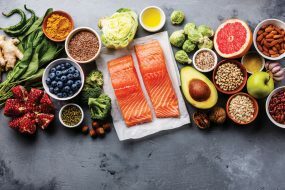 Clusters of people, such as Yvonne Perrin, Lisa Holbrook, Priscilla Magnuson, Badiha Nassar, Sandra Sellers, Barbara Weitenhagen and Elaine Rister, were found at a variety of locations, inside and out. Whether munching on treats inside, surrounded by lights, trees, and wreaths, or enjoying the beautiful view of the lake, it was a pleasure for all who attended, including Kathy Tamer, Sandra Kelver, Sarah Foulds, Linda Kelly, Ann Hammond, Jean Simms, Annette Snow Falks, Sharon Dillard and President Ann-Marie Doolin.